Piser Designs – Precision. Imagination. Wood. In 1993 I moved into an unfurnished trailer near Taos, NM. With a Swiss Army knife, a hammer, and a little imagination I began transforming scraps from the woodpile into furniture. 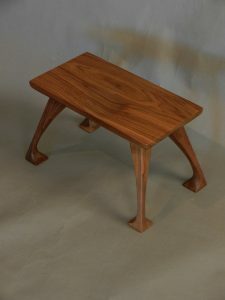 Without training in either design or woodworking it was the natural shapes and beautiful grain that first attracted me. Discovering the functionality of wood inspired me as I began to select unique pieces that fit the developing images in my head. These natural shapes quickly lead me to fill my home with simple sculpture furniture. And now, from those humble beginnings, designing and building special pieces for special places to solve specific problems, I’ve been a working artisan for over twenty years. Although, through a very organic process I have created many pieces of distinctive “Piser Designs” furniture, it is my long list of custom clients to who I owe the most. As a client waves their arms about, doing their best to describe a piece they’d like to commission, their visible excitement is contagious and begins the design build process. This initial arm waving meeting also begins the conversation as we then work together to design a solution. The furniture that emerges from this process continues to excite, surprise and satisfy both my clientele and myself. This process also results in each piece having its own personality, seasoned with the human touch. What’s the point of doing something yourself if you don’t leave your fingerprints on it? If you’d like to buy a piece or discuss a project, please call, type, text or stop by my shop for a visit and we’ll make it happen! The furniture that emerges from this process continues to excite, surprise, and satisfy both my clientele and myself. This process also results in each piece having its own personality, seasoned with the human touch. If you’d like to buy a piece or discuss a project, please call, type, text or stop by my shop for a visit and we’ll make it happen.